Federal Ministry of Women Affairs and Social Development was created consequent upon of the response to The United Nations agreement to establish Institutional Mechanisms for the advancement of Women and Women matters. It is a product of efforts established through a Decree in 1989 giving rise to the National Commission for Women. 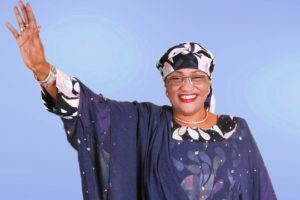 This however was the initiative of the wife of the then Head of State (Dr) Mrs Maryam Babangida of blessed memory. Promoting the general welfare of Women and enhancing their ability to realize their full potentials in various fields of human endeavours. Providing an enabling environment that will ensure the maximum and holistic development of the potentials of the Nigerian child towards national development and nation building. Promoting a multi-sectoral programme synergy for the realization and enhancement of the survival, development, protection and participation rights of children in Nigeria with particular reference to the achievement of set targets enumerated in the Child’s Right Act 2003 (CRA), the National Economic Empowerment and Development Strategy. NEEDS (2004) and Millennium Development Goals MDGs. Embarking on awareness creation and formulation of policies and legislation on survival, development, protection and participatory rights of Women and Children in Nigeria. Promoting responsible motherhood and maternal health as well as protecting the rights of Women. Taking steps that support the elimination of all social culture practices that discriminates against or are detrimental to the overall development of Women and girls. Ensuring the integration of Women in national processes and promoting the mainstreaming of gender on all issues of national importance. Supporting the work of relevant non-governmental organizations (NGOs) and civil society organizations (CSOs) working for the realization of Women and Children’s right. Advocating for the passage and enforcement of laws that protect and project the interest of the Ministry’s target groups particularly the Child’s Rights Act 2003. Central planning of activities of the Ministry such as production of Annual Reports, Ministerial Press Briefings, National Council on Women Affairs Meeting, Tenders Secretariat and HIV/AIDS programmes. Co-ordinating and preparation of the Ministry’s National Plan Medium Term plan and Perspective plan in collaboration with other Department in the Ministry. Collection, collation, analysis, storage and dissemination of data research. Formulates and updates various policies and implementation of strategies for the development of various categories of Person with Disabilities (PWDs). Subvention to recognized Rehabilitation Centre and Non-Government Organization (NGOs). Rehabilitation of alcoholics, drug addicts, cult members and school drop outs etc. Training of professional social workers and the organization and coordination of training facilities for government and non-governmental social welfare agencies.